VTUBE is patent pending technology that allows the air to come in and out of shoe allowing the player’s feet to stay cool. 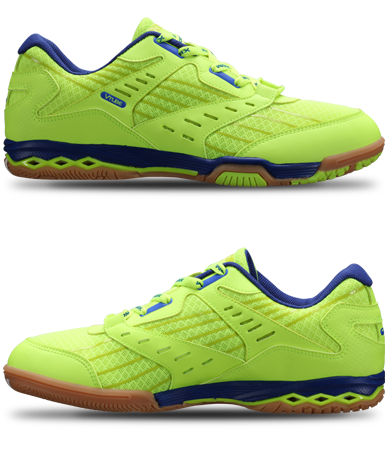 VTUBE shoes are designed to let your feet move more freely and naturally, enhancing the performance of the player through natural fit. XIOM paid a lot of attention to the detail of the shoes, allowing the shoe to last longer and create more enjoyable experience. The Biggest advantage and performance edge we have for the outsole is the fact that we’ve applied new technology that most companies won’t even dare to apply. First we have 3 layers of outsole. Comprised of Six ventilation airflow window, to keep the feet cool and dry. Rubber Stop: The side bump on the side of the outsole prevents slipping and keeps balance while moving side by side while playing. Special composition that is physically hard in nature but very light. Through using this composition we were able to make the shoe lighter and increase durability of the shoe. Non-marking G-Cell shape is comprised of Natural rubber which increases the grip of the shoe. XIOM paid a lot of attention to the detail of the shoes, allowing the shoe to last longer and create more enjoyable experience. V-Cooler enhances the air going in and out of the outsole air tunnel, which keeps the foot dry and cool. There are 4 traction parts to the shoe. We have placed them where it is most important for your foot when you play table tennis. It keeps the player balanced and more stable when moving right and left, and front and back. Torsion Proof is basically a bridge that helps the front part of outsole well attached to the heel part.